An NHS trust at the centre of an investigation into its maternity services has been accused of failing to properly investigate the deaths of at least two babies. Jack Burn and Sophiya Hotchkiss died within six months of each other. 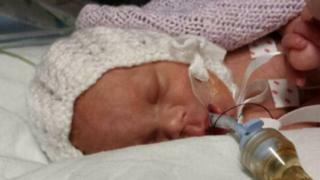 Both families say their concerns were dismissed by the Shrewsbury and Telford Hospital Trust. The trust said it investigates all deaths, and takes appropriate action where necessary. But a third family was told that their daughter's death had been unavoidable, even though an inquest later found it could have been prevented. At least seven avoidable deaths occurred at the trust between September 2014 and May 2016, with some families raising concerns about other deaths. BBC News revealed on Wednesday that Health Secretary Jeremy Hunt has ordered a review of deaths and other maternity errors at the trust. Stephanie Prowse, and her partner, rushed to the Royal Shrewsbury Hospital in September 2014 because she was feeling unwell. She was 31 weeks pregnant with her third child. But the family said they were left in a side room for 40 minutes before staff checked her. A heart rate monitor showed that the baby, Sophiya, had a weak heart beat, and though she was delivered by emergency caesarean she died after 32 hours. 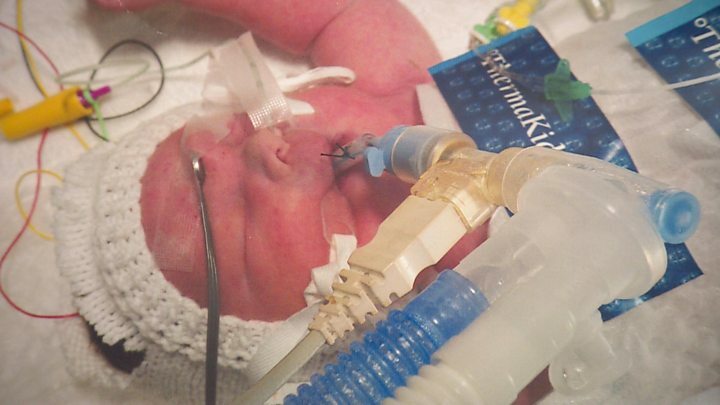 "If they had checked her heartbeat when I first arrived, I believe she would have had a heartbeat when she was born and so she wouldn't have been born sleeping," Stephanie told BBC News. "If they had got her out, I truly believe it would have been a whole different story. I'd have a three-year-old running around." The family asked the trust to look into the circumstances surrounding Sophiya's death but say they have never received a response. For its part, the trust told the BBC that an internal examination of the incident had indeed taken place though the family had not been involved. The Royal College of Obstetricians and Gynaecologists recommends that families are always invited to participate in such investigations. Those concerns have been echoed by the family of Jack Burn. He was born in March 2015 but died within hours, of hypoxia and Group B Strep. Media captionHayley Matthews, mother of Jack Burn: "He would have been OK"
His mother, Hayley Matthews, says that throughout her 36-hour-long labour at the Princess Royal Hospital in Telford, she was refused a caesarean section several times. Instead, she says, she was forced to have a natural birth during which her son's shoulder was trapped. By the time Jack was born, he was blue and limp and died shortly afterwards. "They just expected me to push," said Hayley. "I asked for a caesarean, they said 'no you'll be fine, you can do it'." Ms Matthews says the death was never properly examined. In response, the trust told the BBC that it did investigate the death but admitted it had not included the family in its inquiry. After we highlighted her case, the local coroner is now considering opening an inquest into Jack Burn's death. The family of Pippa Griffiths were initially dismissed by the trust too. Their daughter died last April, around 30 hours after being born at home after contracting the Group B Strep infection. Her parents, Colin and Kayleigh, had called the trust in the middle of the night to say their daughter was vomiting brown mucus. No action was taken, no advice was given, and hours later Pippa died. The trust visited the family to say that nothing could have prevented their daughter's death. Her parents refused to believe this and forced the trust to fully and properly investigate the death. Last week, the coroner ruled that Pippa's death was in fact avoidable, and that the trust had failed to provide the family with the information that could have saved her life. "Why would they not raise that (the death) as a serious incident?" asks Kayleigh. "They knew what had happened, and they weren't going to do an investigation. "That's when I said that's not good enough there will be an investigation and we will be involved," Kayleigh adds. Commenting on Pippa's death, the trust said: "We are truly sorry that we were unable to provide the appropriate care that would have prevented Pippa's death." "We have apologised to Pippa's parents. "We have carried out specific actions to address the issues this tragic case has highlighted to ensure we learn from these devastating events," it added.